Well hello, Friday! What a great recipe we have here today! After a busy week – we deserved it! 🙂 We had friends over for lunch today, so I decided to prepare a seafood lunch. Of course, what lunch would it be without some pasta, right? This time, I prepared a pasta appetizer… I love preparing pasta appetizers because they are quick and easy to make, especially this one. 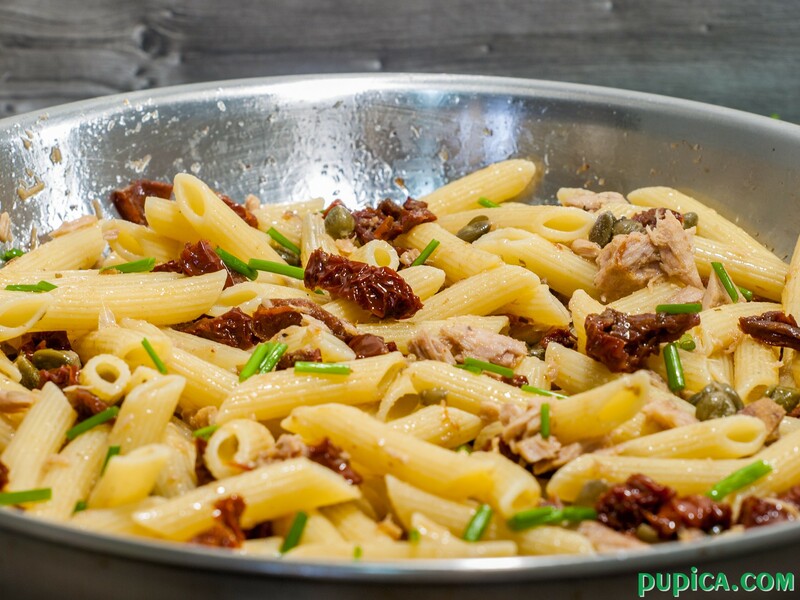 Pasta with sun-dried tomatoes, capers and tuna is one of those recipes that I prepare as a main meal and also as an appetizer. 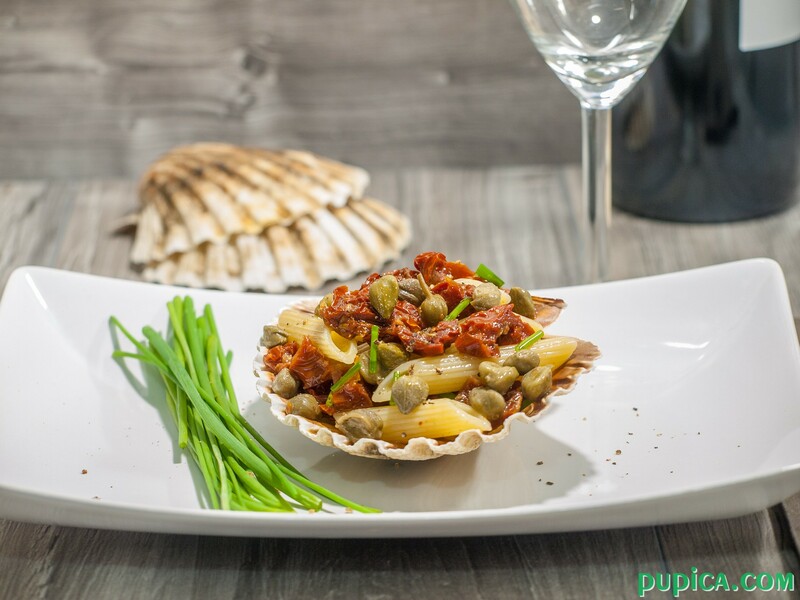 As you can see on the photo I served it in sea shells sprinkled with chopped chives. 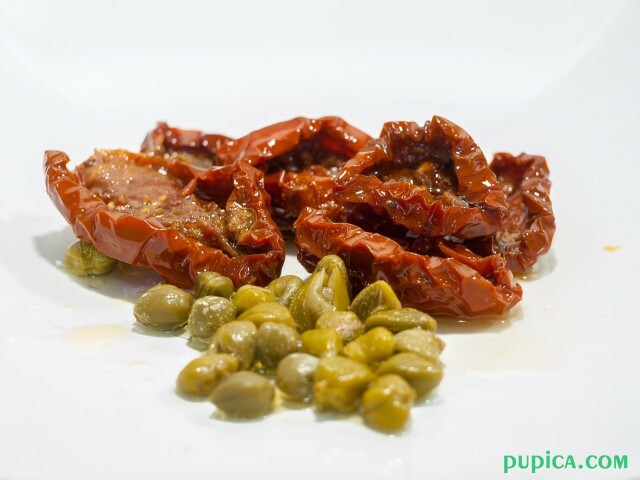 Sun-dried tomatoes, capers, and tuna combine perfectly together. I bought sundried tomatoes in oil, capers pickled in vinegar and tuna fillets in olive oil. 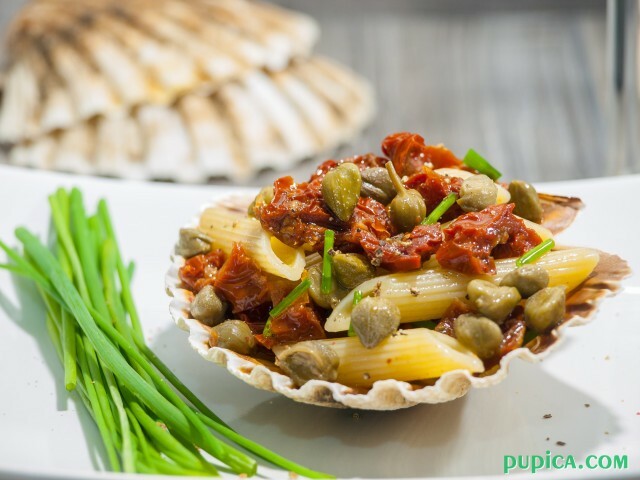 Capers have that unusual flavor that you love or hate, I am one of those who passed from hating capers to eating them often. They have a sharp, pungent aroma that give so much flavor to any pasta recipe and I prefer those pickled in vinegar, those packed in sea salt aren’t my favorite. The recipe is quite simple and you will need just 15 minutes to prepare it, so it is quick enough for an appetizer and super quick if you want to prepare it as a main meal… If you prepare it as an appetizer put less pasta and more condiments. The recipe below is if you want to prepare it as a main meal, the quantities are different if you want to prepare it as an appetizer. For 4 Servings as an appetizer use 60 g of pasta and the quantities of other ingredients divide by 2. 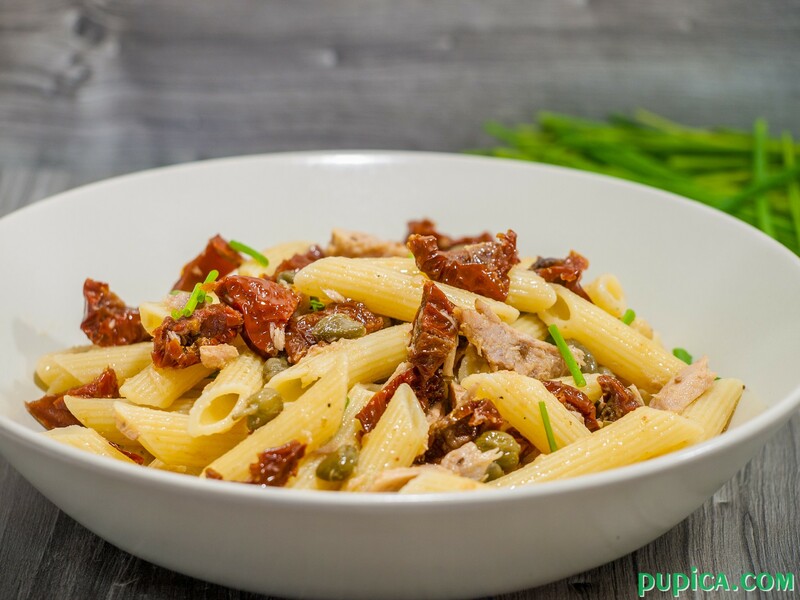 This recipe can also be served as pasta salad, which means that you have to drain and rinse the pasta under cold running water and just add other ingredients without cooking. It is absolutely delicious either way you choose. If you don’t like chives, you can sprinkle it with chopped basil leaves or for even more unusual flavor with fresh thyme. I chose chives because as this recipe is prepared without the onions which I love adding in almost all of my recipes, and chives gives that light oniony flavor to the recipe. I almost never use dried chives because ti gives less flavor, don’t know if you ever tried it, but when I add dried chives, to me it seems like they give no flavor to the dish, like, so I prefer the fresh one. So enjoy this flavorful dish and if you like let me know what you think. 2Heat the oil in a skillet and add garlic clove. Remove it when golden brown. 3Add sliced sundried tomatoes, caper and cook for 5 minutes over low heat. 4Add tuna and chives and stir to coat for a minute. 5Drain the pasta and add it in the skillet with other ingredients. Toss well to coat.